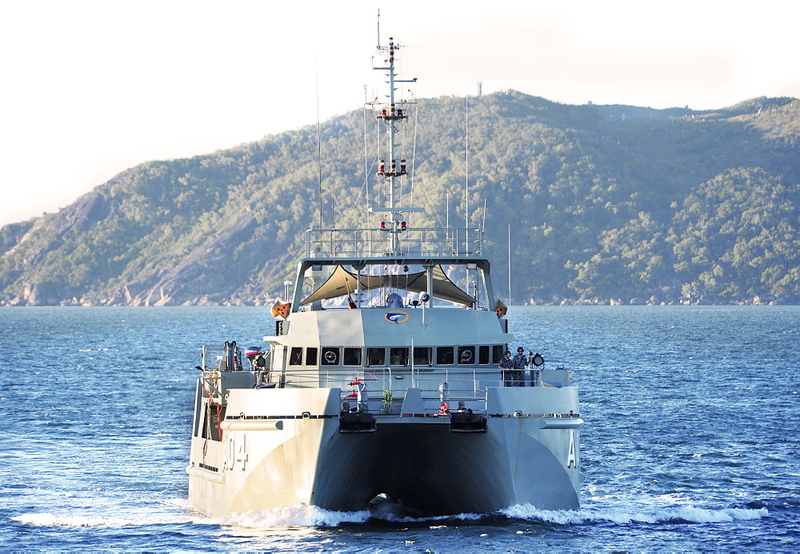 The AGSCs HMA Ships HMAS Paluma (IV) , HMAS Mermaid, HMAS Shepparton (II) and HMAS Benalla (II), generally operate in pairs, and are designed for hydrographic survey operations in the shallow waters of northern Australia. Their twin hulls provide good stability in heavy conditions, and good living room and space below the main deck. In addition, the catamaran hull sits well out of the water, the ship drawing only 2.2 metres - a favourable characteristic in shoaling and reef waters where the ships are required to operate. Each SML carries the latest in navigation aids, and survey and computerised hydrographic data processing equipment. All data collected by the ship is stored on CD-ROM and forwarded to the Australian Hydrographic Office for subsequent publication in navigational products ranging from paper to electronic charts.